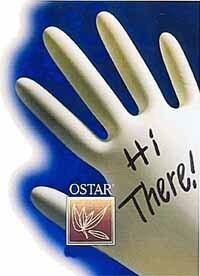 Ostar oat powdered gloves use a highly refined powder made from oats. This oat powder is a purified form of colloidal oats, a known skin protectant. The gloves are cornstarch-free, which reduces the risk of skin irritation and latex allergy. They go on easily without the mess of USP Absorbable Dusting Powder cornstarch and use less powder than the average cornstarch powdered glove. Ultravena Industries, P.O. Box 5516, De Pere, WI 54115-5516. Tel: 800-888-6954; Fax: 920-338-0895.